Weddings are always a beautiful occasion, but most weddings happen in the summer months, leaving winter weddings few and far between. This is one reason that a winter wedding can be so special. Most people like to have their wedding in the summer when the weather is more likely to be sunny. However, a cold, crisp day can give a lovely atmosphere, and many people are even lucky enough to have snow at their wedding! 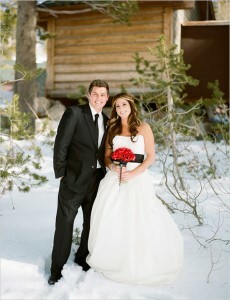 One area where winter weddings can make a striking choice is clothing. If you browse a popular Mother of the bride blog, you will find ideas on exciting wedding fashion and glamorous makeup tips. There are so many choices when it comes to fashion at winter weddings. From cosy boleros to fur shrugs, wedding fashion can be much more exciting in the winter months! The ever-popular strapless wedding dress can be dressed up with a stole or bolero in matching ivory, white or cream, which is flattering to the skin tone and can often look more elegant than bare arms. Some opt for a sparkly thread throughout the shrug while others choose a matt finish. Many brides getting married in the winter require a shoe that is warmer than those they would wear in the summer. Thankfully, there is plenty of choice when it comes to winter wedding shoes. From leather to satin, a covered toe is the order of the day for the colder months. The winter weather also means a sturdier shoe can look perfect, which gives brides and mothers of the brides license to wear a thicker heel. This is often a godsend when dancing the night away! There are many places you can get inspiration for a winter wedding, such as Style & the Bride, along with other extensive online magazines. These guides can help not only with fashion choices, but also with makeup, venue ideas, themes, décor, flowers, outfits for mother of the bride, and even tips on the wedding cake! Wherever you are holding your winter wedding, the colder months can offer a unique atmosphere that will give your wedding a crisp, exciting and even Christmas-y feel. Embrace the fashions and enjoy tips from online bridal magazines to make the most of your unique day!